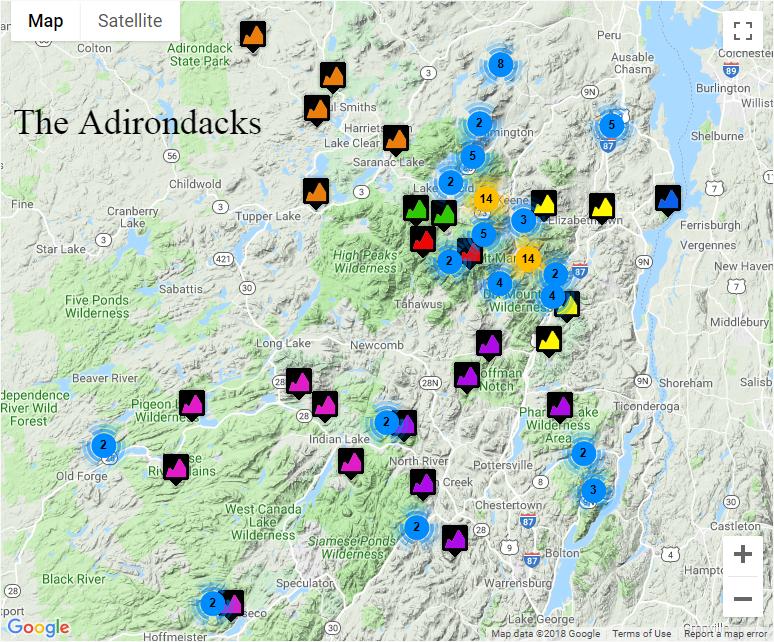 One of the most overlooked areas for hard ice and mixed climbing in the Northeast. You just have to know where you are going, and have the weather with you. A very popular practice and top-roping area. Expect crowds on the weekend. The 1.5-mile approach is easy and usually well packed. When you reach the falls area take the spur trail to the left into the chasm. Park in the parking lot on the south side of the road. 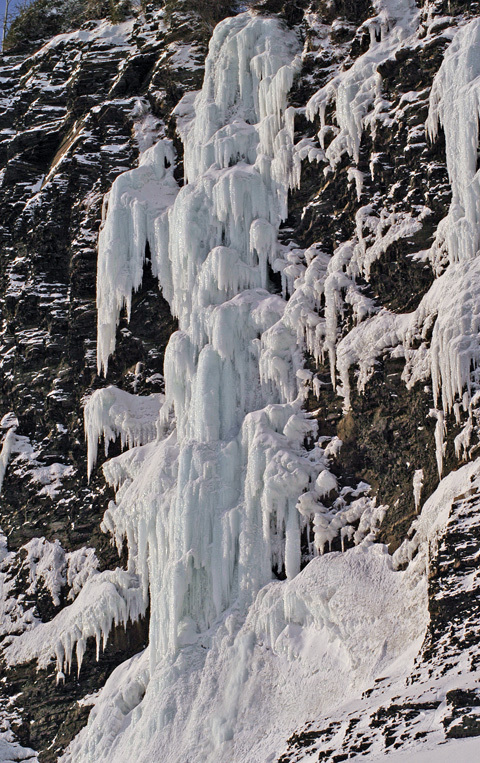 A big wide waterfall area with a verity of ice climbs from WI2 to WI5 and 40m to 120m in height. Easy access and a good area to learn to ice climb. A classic north country climb. The parasol can be huge! Park at the 2nd pull-off below the visible climb on the left after entering the notch from the south. Drive Rt 113 north towards Evans Notch and park off to the side where possible at the entrance to the Basin Campground. Hike/ Ski into the notch, climbs are on the left at the top of the notch. The premier alpine climbing area of New England. Home of Cannon cliff and the legendary ice climb "The Black Dike". With an easy approach and many climbs of all grades, this area receives a lot of traffic. Climbs are 1-2 pitches in length with simple descents. 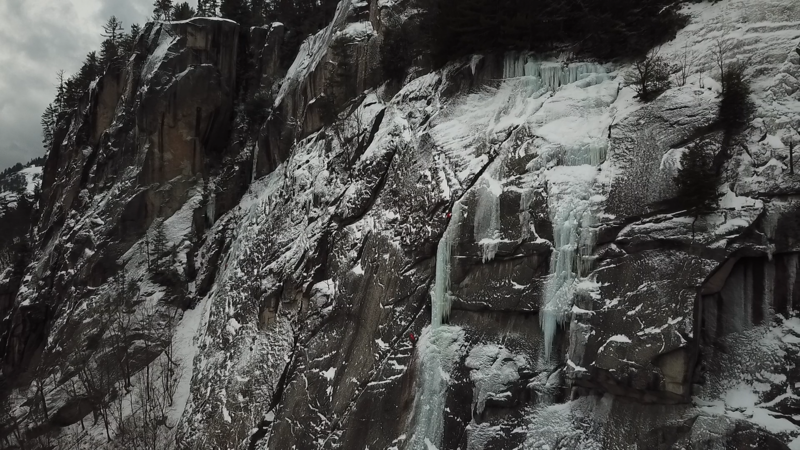 This area contains a number of quality ice climbs. 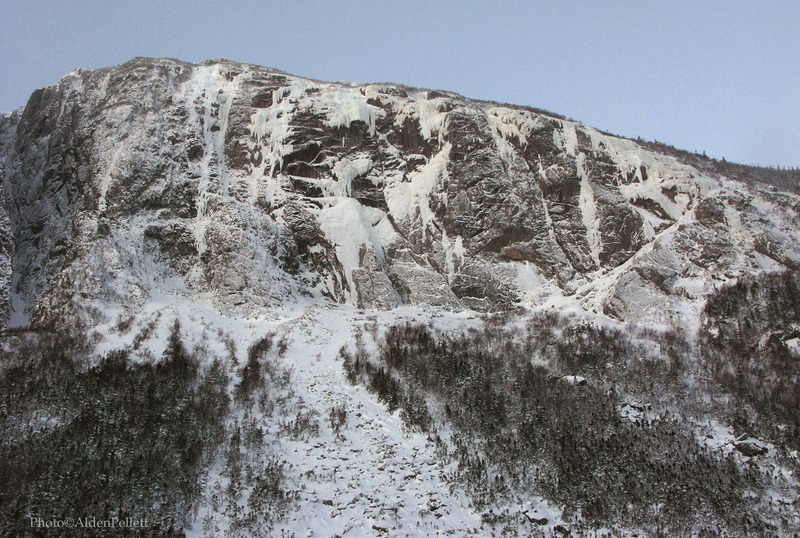 It has been a favorite destination for Maine ice climbers. On the TCH highway take the Grand Falls exit just after you cross the Saint John River. You are now on Madawaska Rd. Drive past the mall etc., and the falls are obvious on the right. At the intersection near the bridge, go straight and head up the hill onto Tobic Road for 200m, and park at the Caisse Populaire. Access the gorge via the "Needs Convenience Store" parking lot. A 2 minute roadside scramble takes you to the edge, and a 60m rappel is necessary to get into the gorge. Some good climbs 70' to 100' in length with an easy approach. Head to the obvious cliff area from the parking. This area is popular and can be crowded sometimes on holidays and weekends. Park on the eastbound side of the road near a yellow diamond road sign. Allow room for traffic and snow plows. During a snowstorm is not recommended to park on the side of the road. You could be towed. 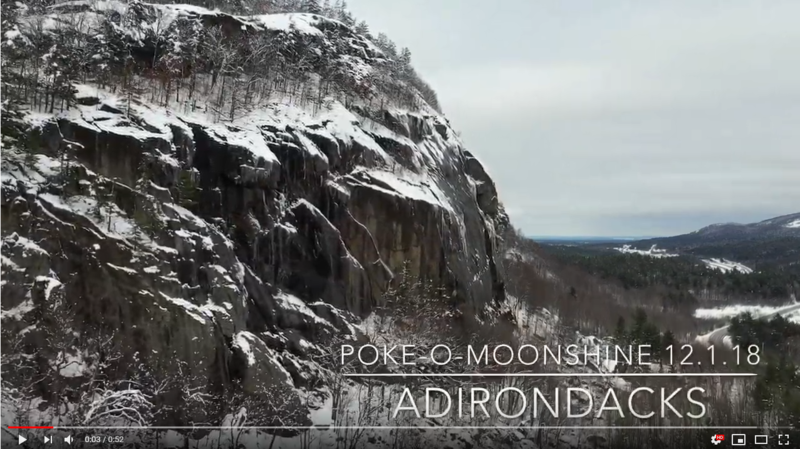 Approach: Use the Mont Pinacle hiking trails, and the maintained hiker access for the rock routes. It's about a 25 minutes hike. Follow the main trail until a well traveled climber's trail breaks off right down towards the lake and cliff. This is the parking area for Mount Webster. It is a plowed pullout on the west side of rt 302. Follow the railroad tracks south. Climbs on your right. 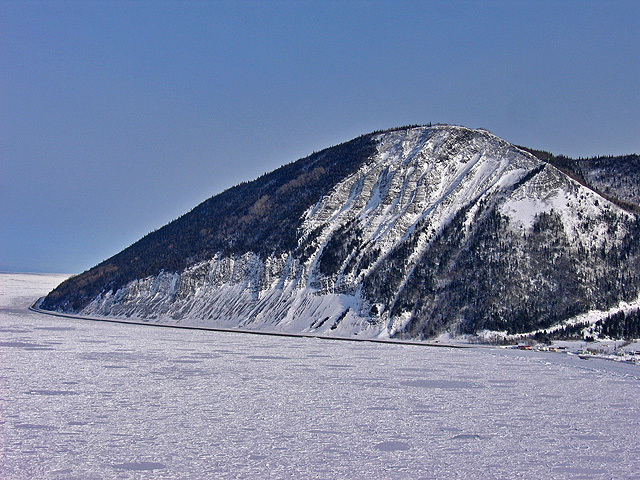 Mount-Saint-Pierre offers great climbing. Mixed gully's on Mt St Pierre and hard waterfall ice right off the road. Also up the river is Le petit Willoughby. 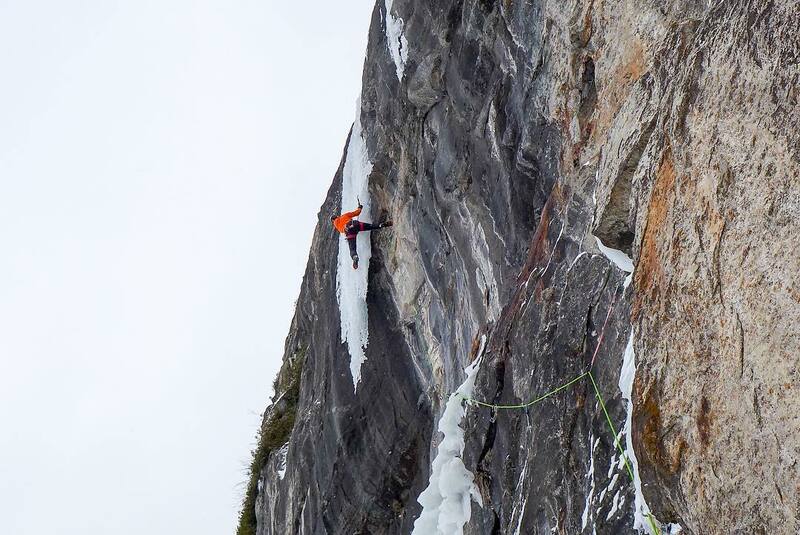 A well-known rock climbing area that also offers a few great ice climbs. The area has easy access and it can be viewed from the highway. Cochrane Lane is 1.6 km south of Welsford, to the east. Drive almost to the end of the lane, and park near a small gravel pit before the farm. Hike across the field, and follow the trail to the ice (20 minutes). A good number of reliable climbs close to the road from WI3 to WI5, one pitch in length. There is a pull out just before the road narrows sign coming from the north. 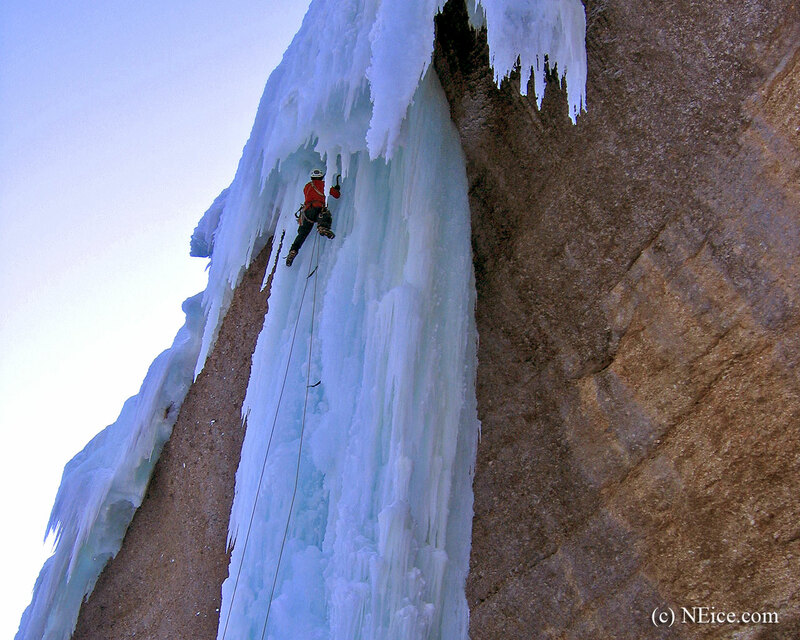 Home to the most beautiful ice climb in the northeast, Way in the Wilderness WI5. With its southern exposure, you need cloudy and cold weather to bring it in. Cross the bridge and ski, snowshoe or hike on the trail on your left just after the bridge. Head west and then leave the trail when the cliff is in sight and head up a to the cliff. Park in the Albany Covered Bridge parking lot on the north of the main road. 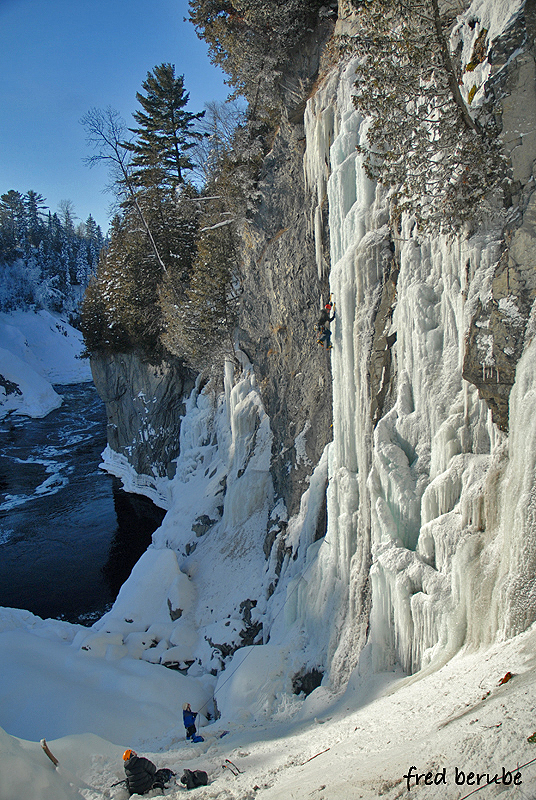 The most sought-after ice climb in Quebec. A true test piece for the aspiring ice climber. A great place to stop on your way around the peninsula. Many good climbs in the area. This area has a marine environment and climbs takes some time to freeze. Mid to late winter is best. Park on the side of the road at the edge of the field just before the houses coming from the east. You cannot leave your car on the side of the road at night or when there is low visibility (heavy snow/rain). If possible leave a note saying you're climbing. Cross the field and find a wood staircase to the river. Be careful not to be too far west. 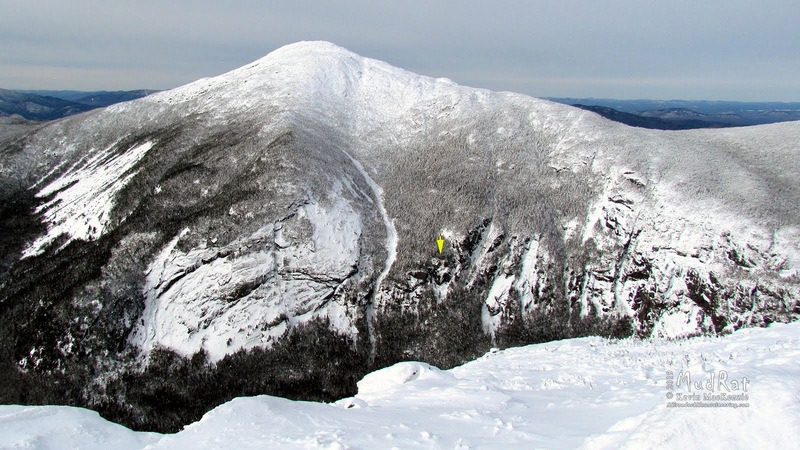 The Presidential range has the highest mountains in the Northeast and some of the harshest conditions. Be prepared! Good climbing area but with its low elevation and south facing cliffs it takes extended cold weather to bring it in. But when it is in, it is great! Park in the plowed out parking lot on the north side of Buffalo Rd. A great mixed climbing area. The climbs range fron M5 - M11 and 25 to 60 ft in height. This area was once used as a pre-comp for the final Competition at Festiglace. Parking is at the Portneuf Natural Regional Park. Take the obvious trail downstream to where the trail splits. Turn left to stay with the river. There should be a sign that says "Escalade" with an arrow. In about 3 minutes, you will come to the central wall. Excellent area with good climbs away from the crowds WI3-5. The Shell Pond road is Private property, please respect the owner. If the road is plowed drive to the gate before the stone house. Please use the fields to the south to avoid walking through the yard. Head east to the cliff.